Married Name Her married name was Speidel. Name Variation Anna Barbara Rilling was also known as Barbara. Anna Barbara Rilling married Sebastian Speidel, son of Jacob Speidel, at Erie, Erie, Pennsylvania. Anna Barbara Rilling was born on 4 February 1826 at Dusslingen, Wuerttemberg, Germany. [S249] U.S. Federal Census 1850 U.S. Federal Census, by Ancestry.com, Stamp 132. Dwelling 182-200. Name Variation Charley S. McCain was also known as Charles S.
Charley S. McCain was born on 19 October 1868 at Wisconsin. He was the son of John McCain and Mary Speidel. Charley S. McCain died on 5 June 1898 at Wisconsin at age 29. [S247] U.S. Federal Census 1870 U.S. Federal Census, by Ancestry.com, Year: 1800; Census Place: Buena Vista, Richland, Wisconsin; roll: M593_1734; Page: 578A; Image: 59; Family History Library Film: 553233. [S246] U.S. Federal Census 1880 U.S. Federal Census, by Ancestry.com, NA Film Number T9-1445 Page Number 30B. Married Name before December 1913 As of before December 1913,her married name was McCain. Martha Merritt married George Jay McCain, son of John McCain and Mary Speidel, before December 1913. Martha Merritt died in 1916. Married Name 1932 As of 1932,her married name was Fowler. Married Name 9 July 1971 As of 9 July 1971,her married name was Davis. Blanche Estelle McCain was born on 25 December 1913 at Durham, Durham, North Carolina. She was the daughter of George Jay McCain and Martha Merritt. Blanche Estelle McCain married Joseph Chester Fowler in 1932 at Hastings, St. John, Florida. Blanche Estelle McCain married James English Davis on 9 July 1971 at Palatka, Putnam, Florida. Blanche Estelle McCain died in March 1977 at Dunn, Harnett, North Carolina, at age 63. James English Davis was born on 20 November 1915. He married Blanche Estelle McCain, daughter of George Jay McCain and Martha Merritt, on 9 July 1971 at Palatka, Putnam, Florida. Joseph Chester Fowler was born on 13 March 1898. He married Blanche Estelle McCain, daughter of George Jay McCain and Martha Merritt, in 1932 at Hastings, St. John, Florida. Joseph Chester Fowler died on 1 June 1968 at Palatka, Putnam, Florida, at age 70. Charles Halsey McCain was born on 28 July 1929 at Van Wert, Decatur, Iowa. He was the son of Holsey Charles McCain and Mabel Lorene Jones. Charles Halsey McCain died on 12 April 1997 at Bouton, Dallas, Iowa, at age 67. Larry Earl McCain was born on 14 January 1931 at Rippey, Greene, Iowa. Larry Earl McCain died on 26 September 1994 at Meadow Vista, Placer, California, at age 63. William Dean McCain died on 11 April 1942 at Rippey, Greene, Iowa. He was born on 11 April 1942 at Rippey, Greene, Iowa. Deborah Lynn McCain died on 4 February 1951. She was born on 4 February 1951. She was the daughter of Holsey Charles McCain and Mabel Lorene Jones. Jacob Speidel was born circa 1790 at Germany. John McCain was born circa 1872 at Wisconsin. John McCain died before 1900. Christine Frederica Speidel was born on 20 March 1851 at Meadville, Crawford, Pennsylvania. She was the daughter of Sebastian Speidel and Anna Barbara Rilling. Charles H. F. Speidel married Minnie (?). Charles H. F. Speidel was born on 9 December 1852 at Erie, Pennsylvania. He was the son of Sebastian Speidel and Anna Barbara Rilling. [S246] U.S. Federal Census 1880 U.S. Federal Census, by Ancestry.com, NA Film Number T9-1445 Page Number 131D. Katherine Ann Speidel was born on 2 June 1859 at Richland Center, Richland, Wisconsin. Stephen Douglas Speidel was born on 17 April 1861 at Richland Center, Richland, Wisconsin. Minnie (?) married Charles H. F. Speidel, son of Sebastian Speidel and Anna Barbara Rilling. Minnie (?) was born circa 1849 at New York. Clarence Speidel was born circa 1878 at Wisconsin. He was the son of Charles H. F. Speidel and Minnie (?). Katie Speidel was born circa December 1879 at Wisconsin. She was the daughter of Charles H. F. Speidel and Minnie (?). Name Variation Gertrude F. Weise was also known as Weese. Name Variation Gertrude F. Weise was also known as Wiese. Married Name after May 1910 As of after May 1910,her married name was Mercer. Gertrude F. Weise was born in September 1893 at Nebraska. She was the daughter of Henry A. Weise and Mary E. (?). Gertrude F. Weise married Robert H. Mercer, son of Amosa Harrington Mercer and Ellen Connie Flora, after May 1910. Gertrude F. Weise and Robert H. Mercer were divorced before 1923. Gertrude F. Weise died after 1925. 1915 Battle Creek, Ida, Iowa Gertrude F. Weise and Robert H. Mercer appeared on the census of 1915 at Battle Creek, Ida, Iowa. [S245] U.S. Federal Census 1900 U.S. Federal Census, by Ancestry.com, Year: 1900; Census Place: Omaha Ward 2, Douglas, Nebraska; Roll: T623_ 923; Page: 3B; Enumeration District: 19. [S244] U.S. Federal Census 1910 U.S. Federal Census, by Ancestry.com, Year: 1910; Census Place: Maple, Ida, Iowa; Roll: T624_406; Page: 10A; Enumeration District: 0055; Image: 865; FHL Number: 1374419. Donald Lee Mercer was born on 21 January 1913 at Iowa. He was the son of Robert H. Mercer and Gertrude F. Weise. Donald Lee Mercer died on 11 January 1973 at Lane, Oregon, at age 59. 1915 Battle Creek, Ida, Iowa Donald Lee Mercer appeared on the census of 1915 in the household of Robert H. Mercer and Gertrude F. Weise at Battle Creek, Ida, Iowa. 1 January 1925 Battle Creek, Ida, Iowa Donald Lee Mercer is listed as nephew on the census of 1 January 1925 in the household of Charles E. Rogers at Battle Creek, Ida, Iowa. [S250] U.S. Federal Census 1930 U.S. Federal Census, by Ancestry.com, ED47-15. Dwelling 188. 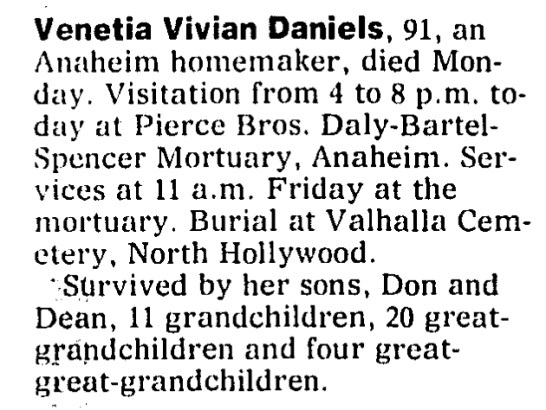 Married Name 29 October 1920 As of 29 October 1920,her married name was Daniels. Venetia Vivian Rogers was born on 22 June 1901 at Battle Creek, Iowa. She was the daughter of Charles E. Rogers and Etta Grace Mercer. Venetia Vivian Rogers married Clarence Murray Daniels on 29 October 1920. 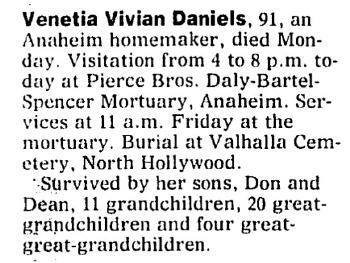 Venetia Vivian Rogers died on 2 November 1992 at Orange, California, at age 91 Venetia Vivian (Rogers) Daniels obituary. In June 1923 at Rippey, Greene, Iowa, Mr and Mrs C M Daniels, Robert Mercer, and Blanche Lyan visited George Mercer and Lillian Parr homes. 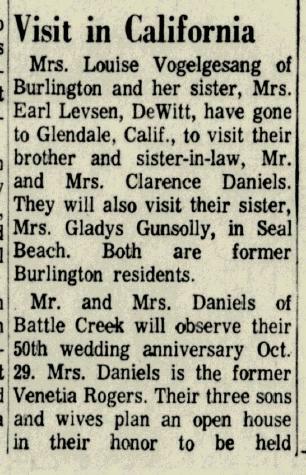 On 29 October 1970 at California Clarence and Venetia (Rogers) Daniels 50th wedding anniversary. [S244] U.S. Federal Census 1910 U.S. Federal Census, by Ancestry.com, ED55. Dwelling 47. [S243] U.S. Federal Census 1920 U.S. Federal Census, by Ancestry.com, ED65. Dwelling 9. [S250] U.S. Federal Census 1930 U.S. Federal Census, by Ancestry.com, Year: 1930; Census Place: Harlan, Shelby, Iowa; Roll: 682; Page: 4B; Enumeration District: 13; Image: 663.0. Name Variation Charles E. Rogers Jr. was also known as Charley E.
Charles E. Rogers Jr. was born circa 1906 at Iowa. He was the son of Charles E. Rogers and Etta Grace Mercer. 1 January 1925 Battle Creek, Ida, Iowa Charles E. Rogers Jr. appeared on the census of 1 January 1925 in the household of Charles E. Rogers at Battle Creek, Ida, Iowa. In June 1923 at Rippey, Greene, Iowa, Mr and Mrs C M Daniels, Robert Mercer, and Blanche Lyan visited George Mercer and Lillian Parr homes. Name Variation Mahlon McIntire was also known as Abner Mahlon. Name Variation Mahlon McIntire was also known as M.
Mahlon McIntire was born on 31 October 1827 at Ohio also reported as Nov 1827. He was the son of James McIntire and Jane (?). 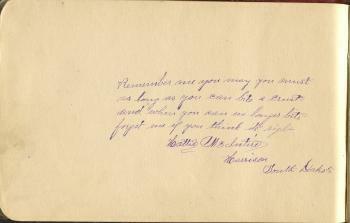 Mahlon McIntire died on 12 June 1902 at Douglas, South Dakota, at age 74. [S235] Iowa Marriages 1851-1900 Marriages, by Iowa. [S249] U.S. Federal Census 1850 U.S. Federal Census, by Ancestry.com, Year: 1850; Census Place: Franklin, Adams, Ohio; Roll: M432_657; Page: 19A; Image: 42. [S248] U.S. Federal Census 1860 U.S. Federal Census, by Ancestry.com, Page 16. Dwelling 112. [S247] U.S. Federal Census 1870 U.S. Federal Census, by Ancestry.com, Page 19. Stamp 10. Dwelling 141. [S246] U.S. Federal Census 1880 U.S. Federal Census, by Ancestry.com, NA Film Number T9-0354 Page Number 547C. [S245] U.S. Federal Census 1900 U.S. Federal Census, by Ancestry.com, ED1. Dwelling 12. Married Name 6 November 1853 As of 6 November 1853,her married name was McIntire. Mary Moore was born on 1 April 1835 at Allen, Ohio. She was the daughter of Benjamin Moore and Roxanna Wood. Mary Moore died on 29 September 1882 at Marion, Iowa, at age 47. [S249] U.S. Federal Census 1850 U.S. Federal Census, by Ancestry.com, Dwelling 236. Married Name circa 1892 As of circa 1892,her married name was Melser. Hattie McIntire was born on 16 March 1865 at Marion, Iowa. She was the daughter of Mahlon McIntire and Mary Moore. 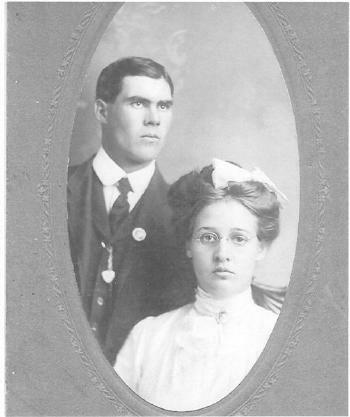 Hattie McIntire married Elmer Ellsworth Melser, son of Alvin Melser and Elizabeth Ivins, circa 1892. Hattie McIntire died in 1898. Hattie McIntire memory book entry for Alice Ewing. John W. McIntire was born on 21 January 1863 at Iowa. He was the son of Mahlon McIntire and Mary Moore. John W. McIntire married Flora B. Parker, daughter of Henry Parker and Emily Eubanks, circa 1898. John W. McIntire died on 5 April 1915 at age 52. [S244] U.S. Federal Census 1910 U.S. Federal Census, by Ancestry.com, ED1. Dwelling 161. Benjamin Moore married Roxanna Wood, daughter of James Wood and Mary Wright. Benjamin Moore was born on 26 October 1796 at East Buffalo, Northumberland, Pennsylvania. He was the son of Emmor Moore Sr. and Hannah Woodward. Benjamin Moore died on 21 February 1873 at Marion, Iowa, at age 76. Roxanna Wood married Benjamin Moore, son of Emmor Moore Sr. and Hannah Woodward. Roxanna Wood was born on 8 September 1802 at Otis, Massachusetts. She was the daughter of James Wood and Mary Wright. Roxanna Wood died on 23 April 1862 at Clay, Marion, Iowa, at age 59. Sophia Moore was born circa 1839 at Ohio.